We have a big ol' bucket of chalk that we play with almost everyday. Our sidewalk and driveway have been know to be very colorful at times! 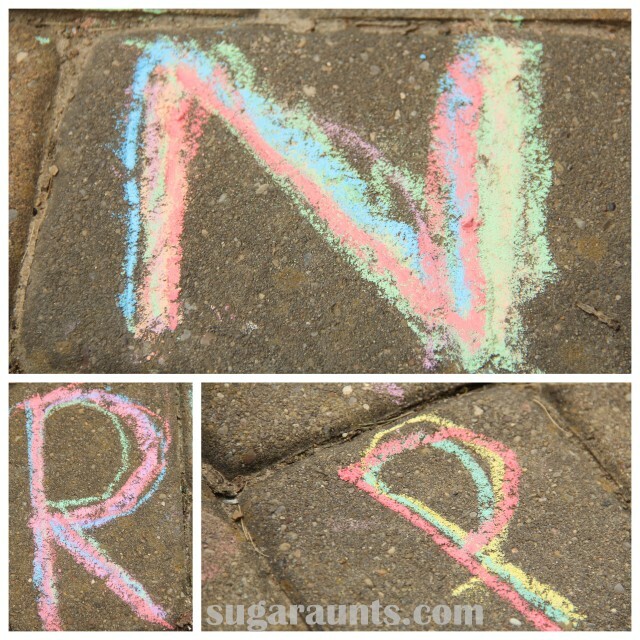 We took the chalk to our sidewalk squares one day this week and practiced a little letter formation. Our sidewalk squares were the perfect area to practice forming letters accurately. I used simple verbal cues to describe the formation of each letter (big line down, little curve around, little line) and we started in the corner of each square as we made the letters. I made the letter first and Big Sister and Little Guy watched. Then we went to work making our letters very colorful! Tracing the letters over and over again was a great way to practice accurate formation. Big Sister got into this activity. Little Guy only wanted to make a few letters that are in his name. When the child is tracing the letters over and over again, they become more efficient at planning out and executing the movements needed to make a letter accurately. This activity is great for a new writer because they are given a confined space to practice a letter, and visual cues (and verbal prompts from mom).